Boy oh boy, have I got a bowl of cozy for you today. I looooooove early fall weather. It’s still mild enough out that I can wear flip flops (I wear them long past what is considered appropriate, hah), but cool enough that I start to crave all the fall foods. 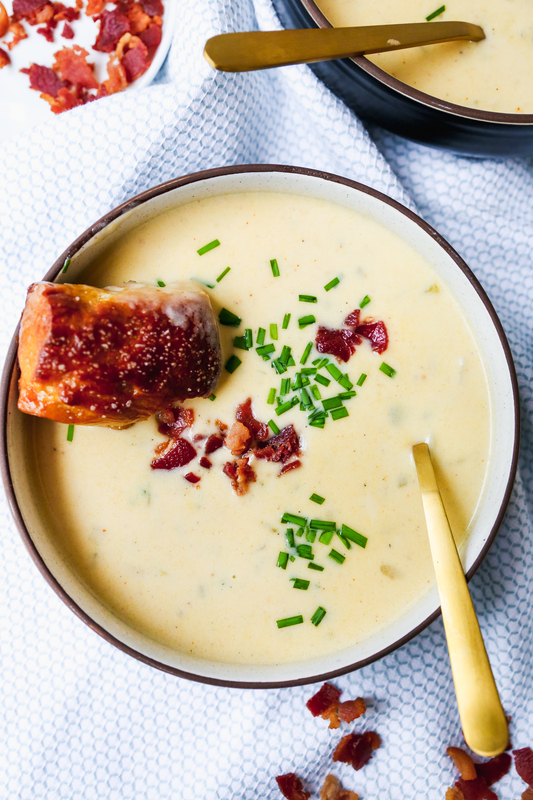 As per usual, soup is at the top of that list! 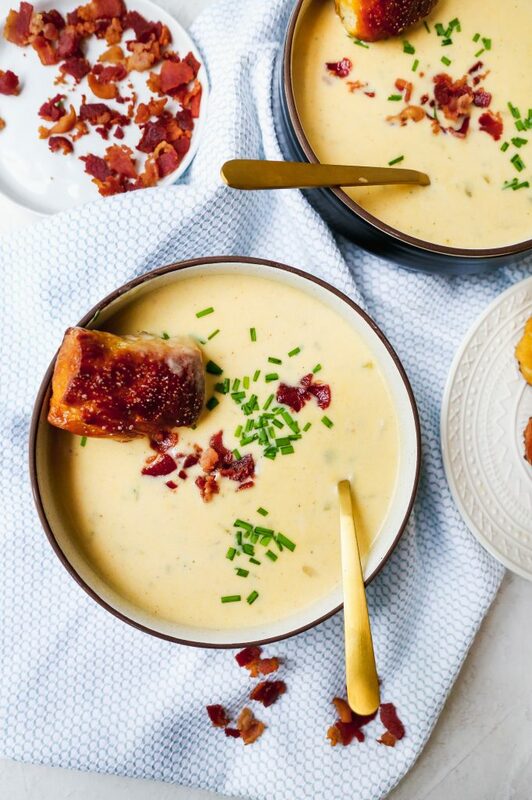 It’s freaking soup season, guys! And I couldn’t be more excited. Especially with all the rain/overcasts days we’ve had around here as of late. Along with my lighting of all the fall-scented candles (Bath & Body Works “Autumn” is my absolute fave) and decking the house out in a copious amount of pumpkin-themed decor, soup is destined to be in my house! 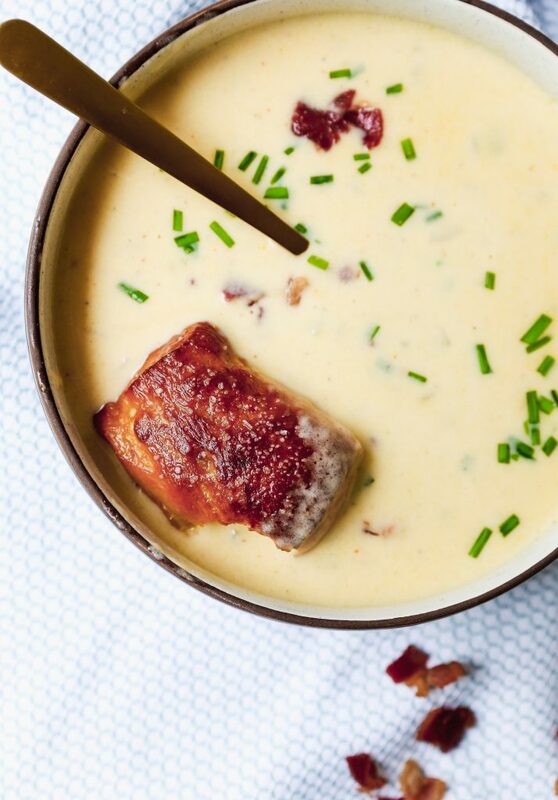 And this beer-cheese soup with bacon is something special. It is like beer fondue meets creamy cheese bisque. 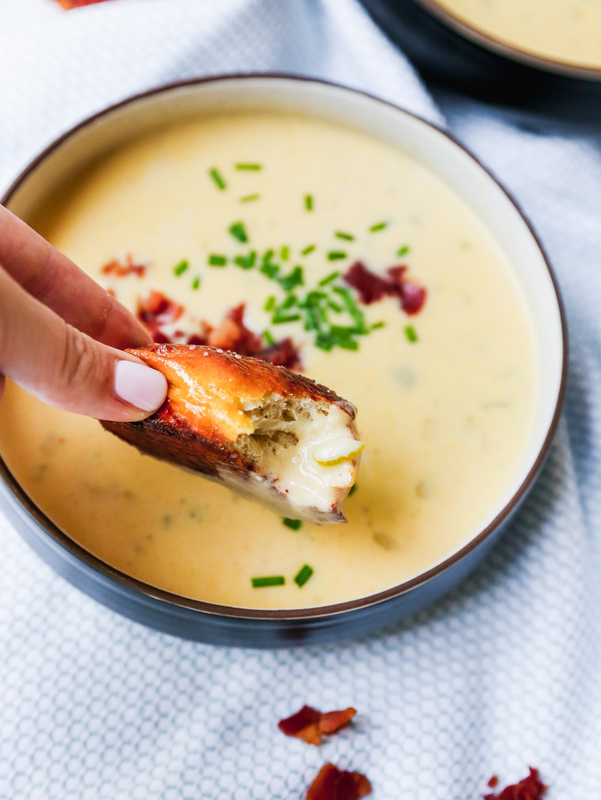 And I like to serve it with the ultimate comfort carb: soft pretzels! The soup itself is fairly straightforward. You sauté some veggies in some bacon drippings (oh yeah, we’re going there) until soft, add in flour to make a roux, and then deglaze the pot with your favorite beer (I actually love using “light” beers in soups like this because they don’t leave behind any bitterness), and then let things simmer away in some stock until super flavorful. 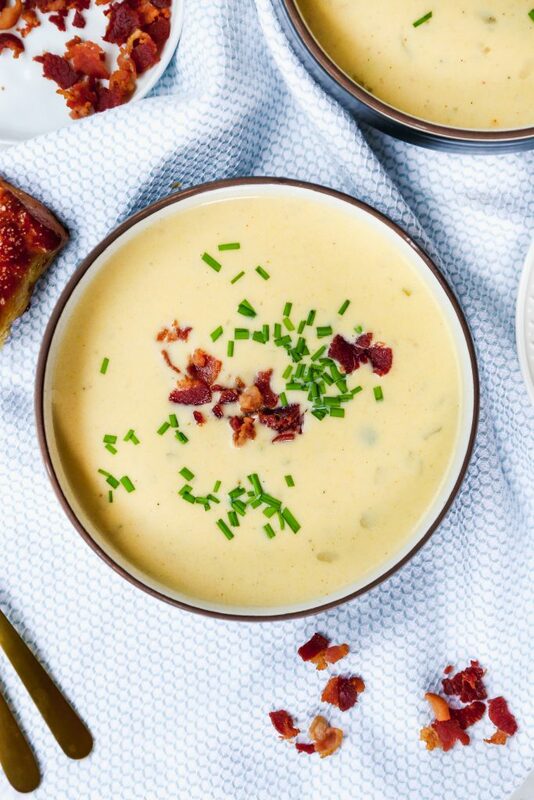 The cream and cheese get whisked in during the last stage of cooking and result in the dreamiest cheese soup ever. 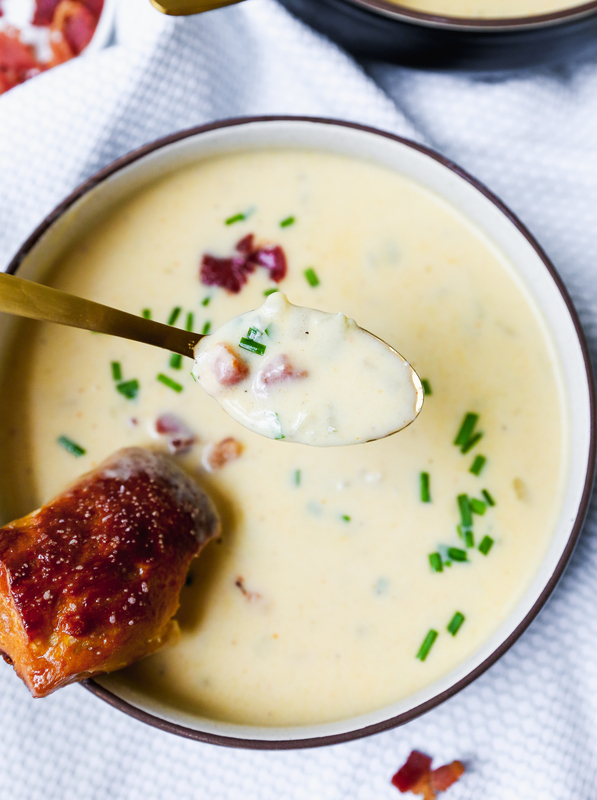 I like to garnish this soup with chopped chives and the bacon used to start out the soup. It is so good, that you don’t really even need the pretzels (I can’t believe I just said that). This pretzel making method is new to me. I followed the recipe on the King Arthur’s flour website because it suggested simply soaking the formed pretzels in a baking soda water as opposed to boiling them in it. SO MUCH EASIER! I decided to give it a go, and I have to say, I think this may be my new go-to soft pretzel recipe. They’re so soft and pillowy on the inside with the greatest chew. 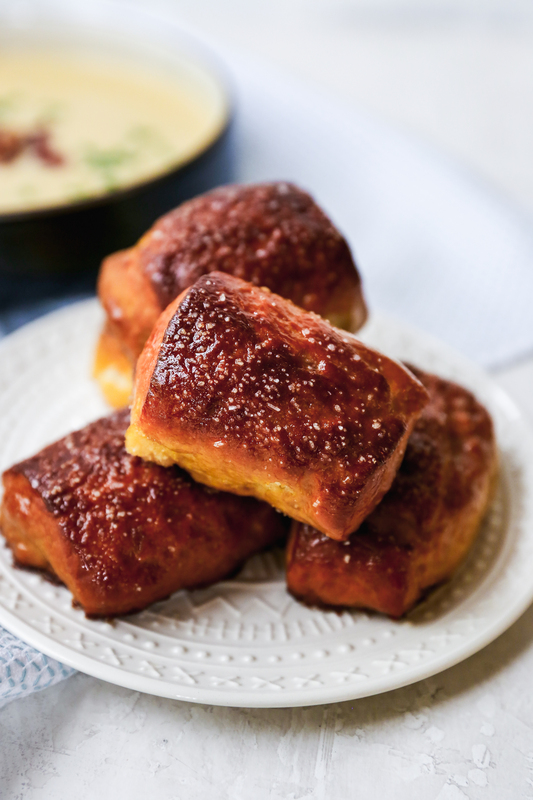 The outsides get deeply golden and slightly crisp in the oven, and then they truly transform into the stuff of dreams. 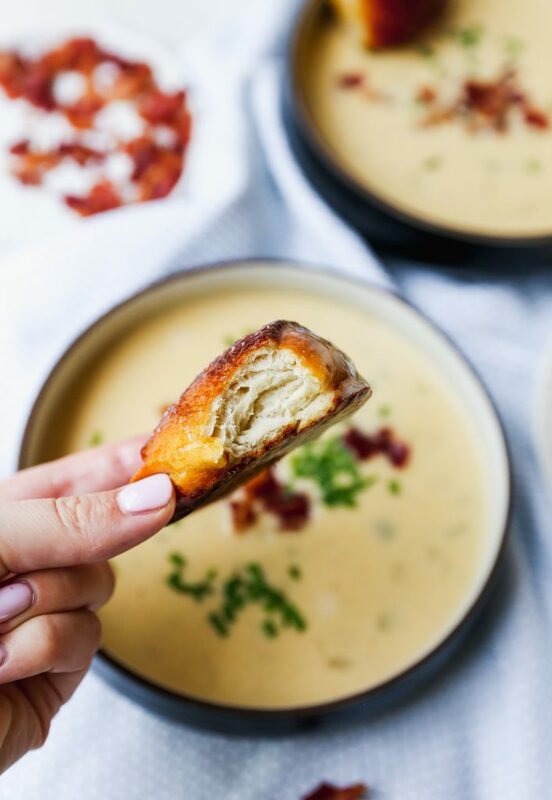 They are IDEAL for dunking in beer-cheese soup. Take it from me. I consider myself an expert at this point. In the bowl of a stand mixer, whisk together the warm water, sugar, and yeast. Let sit in the bowl for about 5 minutes, or until foamy. Add in the flour and salt and knead the mixture together using the dough hook attachment. Knead until a soft and smooth dough forms and pulls away from the sides of the bowl. Lightly oil a bowl and place the dough in the bowl to rest, covered with a towel, for about 45 minutes. While the dough is resting, combine the boiling water and baking soda in a large baking dish, whisking so the baking soda dissolves. Allow the mixture to cool to almost room temperature. Once the dough has risen and doubled in size, preheat the oven to 400°F and line a large baking sheet with parchment paper. Spray the parchment with nonstick cooking spray. On a lightly floured surface, knead the dough for a couple minutes and then divide it into four equal pieces. Roll each piece of dough out into a 12-inch rope. Cut each rope into quarters, yielding four 3-inch pretzels (you an also cut them into smaller, bite-sized pieces if that’s preferred). Once all the pretzels have been cut, gently place them in the baking dish filled with the water and baking soda solution. Turn them to evenly coat and then let them rest in the solution for about 5 minutes. Remove the pretzels from the water solution and place on the prepared baking sheet. Sprinkle with a little salt and then bake for 14-16 minutes or until they are puffed slightly and golden brown. Remove the pretzels from the oven and brush them with the melted butter. Sprinkle with more coarse salt and serve warm alongside the soup (you can keep them warm in a 200°F oven until the soup is ready). Heat a large saucepot over medium heat and add the diced bacon. Cook for a few minutes, stirring frequently, until it is rendered and crisp. Remove from the pan and set aside. 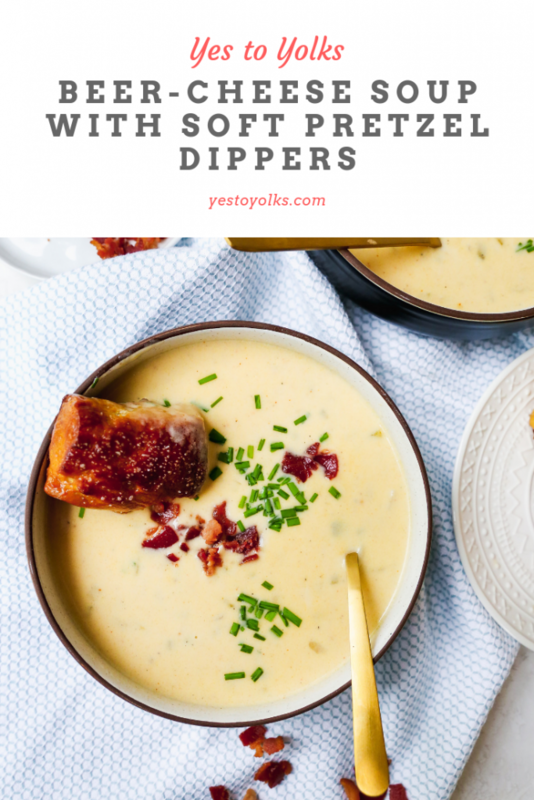 Drain off the bacon drippings until you have roughly 2 tablespoons left (this will depend on your bacon). Add the butter to the drippings and once its melted, add the onion and celery. Cook for 5 minutes and then add in the jalapeno and garlic. Cook for another 2 minutes. Add in the flour and toss to coat all the vegetables. Cook for 2 minutes or until the flour is golden brown. Slowly stream in the beer, scraping up any brown bits on the bottom of the pot. Cook for a few minutes or until the beer is reduced by half. Add in the chicken broth, bring to a simmer, and cook for about 15 minutes, or until the soup is thickened. Add in the heavy cream and grated cheese. 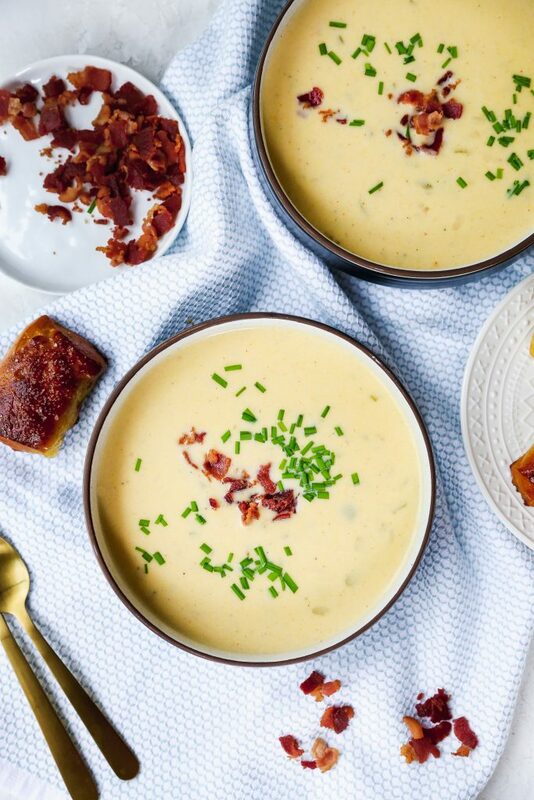 Cook, stirring constantly, until the soup is thick, creamy, and all the cheese has melted. Season, to taste, with salt and pepper. Keep covered and hot until you are ready to serve, stirring occasionally. To reheat the soup, warm over low heat gradually and add more stock to thin, as needed.